The Brooklyn Nets mounted a furious comeback in the 4th quarter, however they fell short and dropped their 14th straight game. The Milwaukee Bucks with this win have now won 3 consecutive games heading into the all-star break. They are now also 2 games back of the eight seeded Detroit Pistons in the race for the playoffs in the Eastern Conference. This was the last game before the all-star break here at Barclays Center. The Nets were looking to pick up just their tenth win of the season. The Bucks were without one of their major contributors; Jabari Parker who is out for the rest of the season and is expected to miss the next 12 months due to an ACL tear. 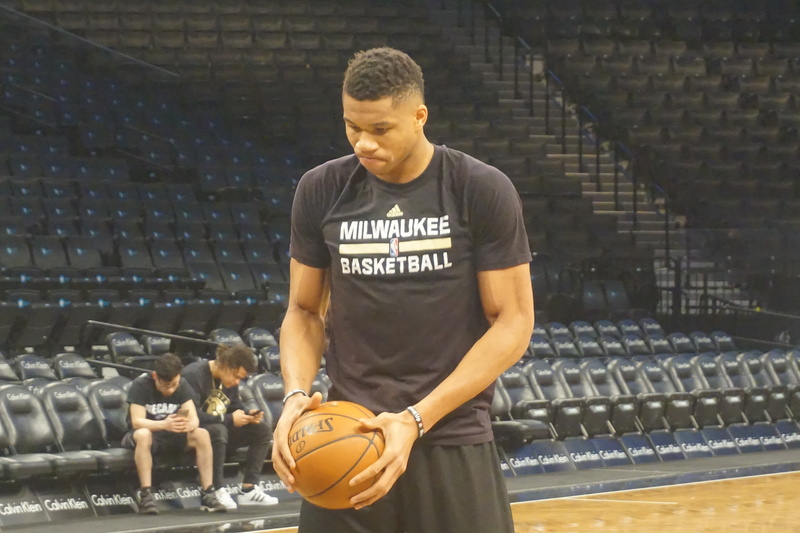 “He had a successful surgery… he’s doing well.” – Bucks coach Jason Kidd. It has been a tough few weeks for the Bucks, they welcomed back sharpshooter Khris Middleton on the very day that Parker went down. Middleton who is on a minutes restriction had a great game, he finished with 20-points on 7-13 shooting while pulling down 3 rebounds and handing out 7 assists. Middleton’s 8-points in the third was part of the reason the Bucks were able to get the win. As a team the Bucks scored 33-points in the third while holding the Nets to 22-points. Let’s face it; Brook Lopez has been nothing but a professional during this tough stretch for the Nets. Tonight was a reflection of how the season has been for Brook, he had 36-points on 12-20 shooting while adding an impressive 8 blocks. He hit 6 of 10 from behind the arc and it still wasn’t enough to lead his team to victory. Jeremy Lin is expected back sometime after the break for the Nets. There were a couple of former Nets returning to Barclays, Jason Terry, Mirza Teletovic and of course Jason Kidd who led the then New Jersey Nets to two consecutive NBA finals from 2001-2003 as a player. If we are talking about the Milwaukee Bucks we must be talking Giannis Antetokounmpo. The 6-foot 11inch young superstar had a monster game for the visiting squad. He finished with 33-points, 9 rebounds and 4 steals but his numbers don’t tell the entire story. Every time he stepped to the free throw line, chants ensued, “MVP! MVP! MVP!” The Greek fans were in attendance and made sure they were heard. Giannis made plays everywhere, on offense he was seemingly unstoppable and on defense he was active. When his team needed big plays he delivered and he put on a show for the fans at Barclays. It was a high scoring affair, the Bucks shot 72% in the first period and 56% overall for the game. The Nets also shot a high percentage they finished the game at 53% from the field. Offense wasn’t the problem for the home team, they could not close out this game defensively and simple mistakes led to costly turnovers during crunch time. The Bucks had six players in double figures including Greg Monroe. Monroe had a big first quarter and also seemed to hit timely baskets for Milwaukee. Michael Beasley is in the starting line up due to Jabari Parker’s injury and he played well, 14-points on an efficient 7 for 9 from the floor. For the Nets, Spence Dinwiddie started and had 19-points and was a big part of the Nets comeback attempt in the 4th quarter. Trevor Booker had 18-points and Joe Harris added 14-points off the bench. The February 23rd trade deadline looms, Brook Lopez’s name has been mentioned in rumors however there has been no moves made by the Nets to date. It remains to be seen if anything will happen by the deadline. For the Nets this loss robbed them of a chance of heading into the break positively and it also robbed them of a win before heading on a long road trip. The Nets will not return to Barclays until March 12th when they host the Knicks.